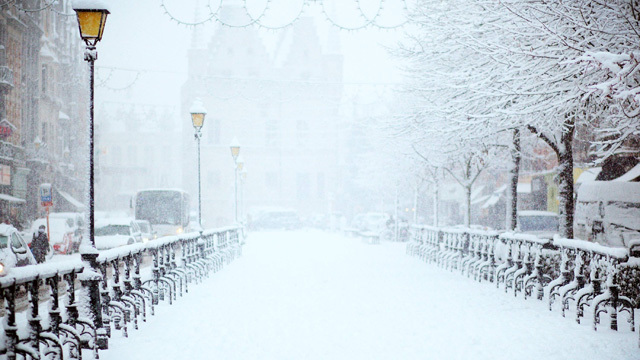 Warm winter coats are a must in order to withstand the harsh weather and freezing temperatures during the cold winter months. We have looked at numerous options, ranging from those suitable for sports to more casual and even work-appropriate jackets and parkas that you can wear this season. Well, having too many options is never a bad thing as you can find exactly what best fulfills your requirements and needs. Today it’s time to look at an anorak, or parka if you’d like to call it that. Anorak, as a term, refers to winter coats that come with a hood, which is typically lined with fur trim, be it faux or genuine fur. 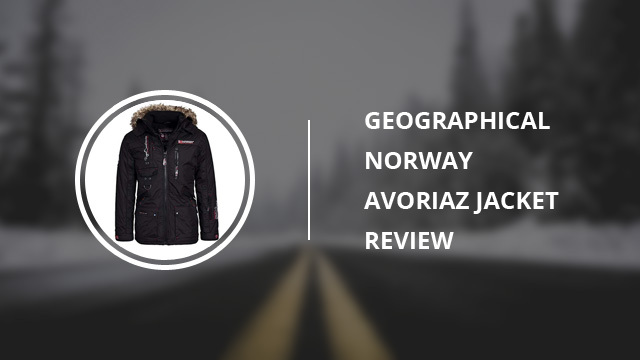 The one we have picked for this single review is Avoriaz, a men’s anorak by Geographical Norway. 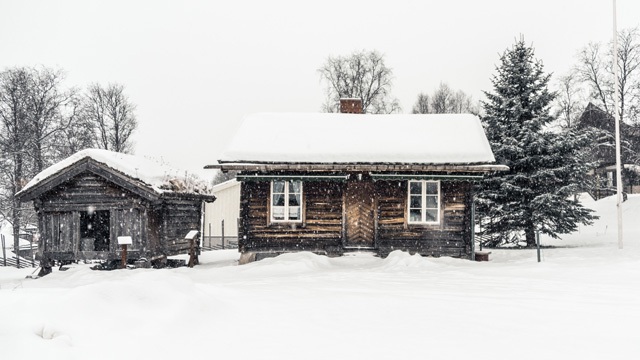 Right off the bat, the price is quite reasonable in our opinion, considering that winter coats are expected to last for at least a few seasons and are well-insulated in order to withstand the cold and sometimes even the elements. Let’s see now this particular anorak’s details and how well it performs. 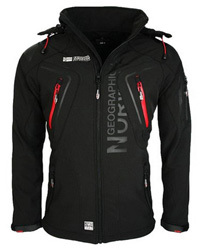 Where To Buy The Geographical Norway Avoriaz Jacket? Being a winter coat, Avoriaz’s main purpose is that of proper insulation and ensuring that you remain warm and cozy in very low temperatures. For that reason, it is not very suitable for autumn or early-spring wear as it may be too warm for those. It is water and wind-resistant, which is always a good quality to have in any jacket or parka since it can keep you well protected even if the weather changes suddenly. 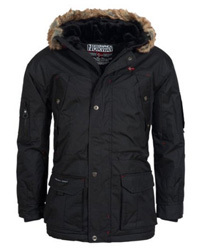 Style-wise, this is a versatile parka that can be worn on outdoor adventures as well as for daily wear. Because it comes with very minimalist logos, it could be worn to work, too, for those of you that work outdoors. 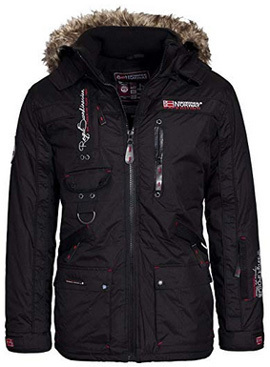 It comes with a detachable hood that is lined with faux fur trim and is adjustable, too. It is also lined with fleece on the inside in order to provide extra warmth, especially if it’s snowing. 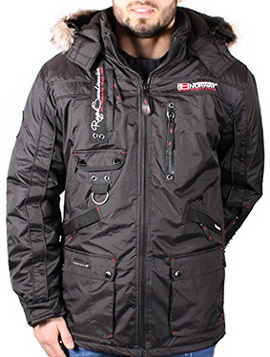 The faux fur trim helps protect the face from cold wind, rain and snow and it also looks quite stylish. The full-length central zipper is water-resistant and concealed, which further prevents water and wind from seeping through. Also water-resistant are the pocket zippers, in order to ensure that any belongings stored in them will not get damaged by the elements. There are numerous pockets on this design, two of which are placed on the sides, two on the chest, two are front pockets, one is on the sleeve and two are inside. One of the inner pockets is a mesh one for cards, gloves, etc., and the other one has Velcro closure. The sleeve cuffs come with inner ribbed and elastic cuffs, while the outer part is adjustable with Velcro fasteners. This combination provides a great fit as well as helps with reducing heat-loss, since the cold cannot get through. Avoriaz is a mid-length cut, which helps cover you better and therefore providing better protection from the cold and the weather. 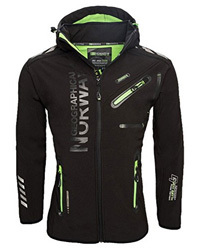 Avoriaz is an entirely synthetic coat, as it is made of 100% Polyester, both inside and outside. The shell is smooth polyester that is able to ward off water and wind, while at the same time being breathable due to the Power Dry technology, which is Geographical Norway’s own creation. The inner lining comes in two parts: the shoulder area is lined with soft fleece, which helps to insulate and keep the shoulders warm and cozy; the rest is made of quilted fabric, which helps with the distribution of the light padding as well as holds it into place. The faux fur trim is made of 100% Polyacrylic and it is soft and fluffy, made to resemble real fur. In regards to color options, unfortunately there isn’t much to say as only the color Black is available for this design. However, Black is a versatile color as it goes well with any outfit color. Now we are all acquainted with Avoriaz, but let’s see if it does in fact live up to its claim. The best way to do this, of course, is by taking a look at what online reviewers had to say about their experience with this design. The first thing that catches the eye with Avoriaz (and any other jacket) is the quality of the fabric and reviewers were quite impressed with how well made it was. Weather-wise it performs very well and it is surprisingly quite breathable, considering that it is an insulated parka rather than a high-activity design. 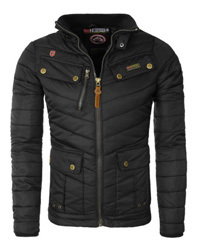 It is warm, it is comfortable to wear and it is resistant against water to a reasonable degree. The numerous pockets are quite useful, especially for those that spend a lot of time outdoors, as there is no need to fumble around with the bag or backpack to access things that you might need on the spot. The cut is slightly bigger, but not so much that you will need to order a size smaller, because this is done with the purpose of layering comfortably underneath. The issues were only encountered rarely on some of the reviews and it all had to do with some threads sticking out in certain parts. Judging from the online reviews and the performance of Avoriaz, it’s up to you to decide if the price justifies the quality of this particular design. All we can say is that it is indeed warm and breathable, it wears comfortably and looks beautiful up close.